The article entitled Assumption of the Blessed Virgin Mary Parish Truckee's Catholic Church, Part 2 of 2, Stained Glass Windows by Katie Holley, is based on a brochure that was prepared in celebration for Assumption's completion of the new church in 2011. ﻿This is a link to the entire brochure﻿ should you wish to review it. Our research staff has done a little more digging and discovered that if you read through Charles Fayette McGlashan's grand-daughter's M. Nona McGlashan's book, Give Me A Mountain Meadow, specifically Chapter 14, 1900 - 1910, the reader will learn more of the specifics of the Donner Monument's planning, construction and 1918 dedication. Even in Nona's book on page 215 there is a similar picture to the one that the California State Parks holds in its collection and which is reproduced (with permission) in TDHS's September 2016 Issue 3 edition on page 7. However, on closer examination, if you compare the two Dedication images, they are not the same. Examining the reverse side of the image held by the California State Parks, there is a story about the Donner Party's descendants that suggests some uneasiness between the descendants about the actual name of the [Donner or Reed] "Party." Descendants in that image are standing facing away from one another. We also stumbled upon an April 29, 1977 article entitled "Native Sons and Daughters preserved Gray's cabin" authored by Doug Barrett in his column My place in the Sun. The image reproduced there and attributed to John Corbett's Historic photo album is the same image as in Nona's book. References used in the Tamarack Wreck article by Dennis Beeghly include the following. Due to space limitations in the printed medium, they could not be added in the printed Echoes newsletter. 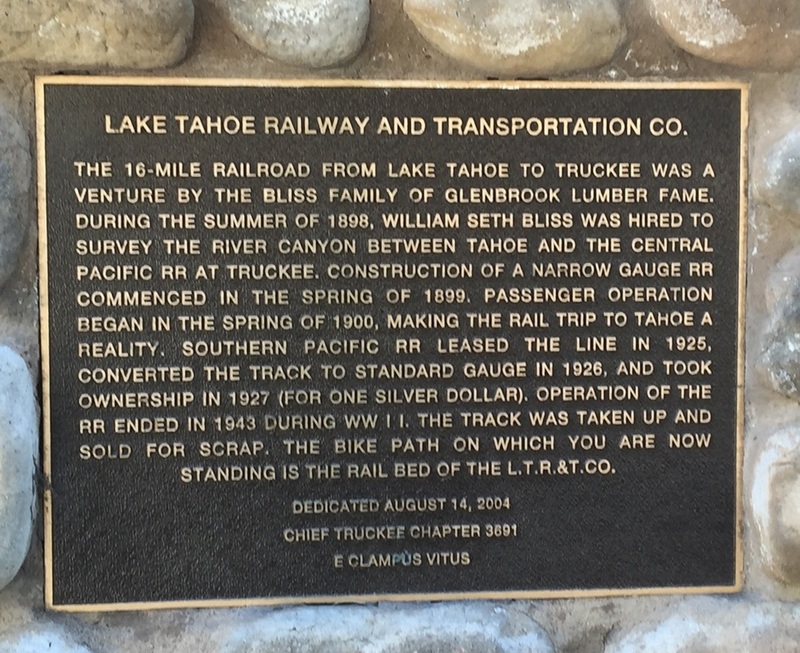 Out bike riding the bike trail from Squaw Valley to Tahoe City, the Editor noticed this plaque about the Lake Tahoe Railway and Transportation Company erected street side of The River Ranch motel and restaurant at the entrance to Alpine Meadows. The current bike trail was built over the original railroad tracks.